"The world's slowest express train" travels between Zermatt and St. Moritz, Switzerland, offering spectacular alpine views during its 7�-hour journey. ABOVE: The Glacier Express crosses one of the 291 bridges between Zermatt and St. Moritz. 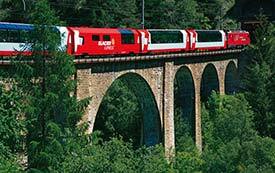 The Glacier Express is one of Switzerland's most famous train excursions. The Glacier Express, which has been operating since 1930, is billed as "the world's slowest express train" and averages 36 km/h (22 mph) during the approximately 7�-hour trip journey on its most popular route, Zermatt to St. Moritz or vice versa. The 275 km miles (169 miles) of narrow-gauge track are punctuated by 291 bridges and 91 tunnels. Trains reach a peak elevation of 2,033 meters (6,670 feet) at the Oberalp Pass near Andermatt and traverse the 15-km (9.5-mile) Furka Tunnel, which takes a shortcut beneath the Alps between Andermatt and Brig. Rolling stock varies from train to train. State-of-the-art "Glacier Express Premium" trains, which were introduced in 2006, have new panorama cars in First and Second Class (available for a higher surcharge). Other trains use conventional cars in First Class and panorama cars in Second Class. The Glacier Express used to be a summer-only train, but today it operates year-round. The summer timetable offers four trains per day; the winter schedule is more limited. The one-way fare between Zermatt and St. Moritz was CHF 268 (first class) or CHF 152 (second class) in spring, 2019, when this article was last updated. In addition to the fare, you'll pay a seat-reservation fee of CHF 23 (winter), CHF 33 (shoulder season), or CHF 43 (high season). Note: Swiss rail passes are also good on the yellow Postal Buses, which makes it easy to explore smaller villages from either end of the journey or--if you break your trip--from intermediate stations along the line. Some travelers feel that the south side of the train (the left side in the St. Moritz-Zermatt direction) offers better views, but both sides are fine. If you dislike crowds (especially mobs of fellow tourists), skip the Glacier Express and take ordinary trains along the Glacier Express route. You won't get panoramic windows or an antique dining car, but you'll enjoy the same scenery--and you'll get a chance to stretch your legs by changing trains at several points along the way. First Class may be less crowded than Second Class, although that's not always true in high season. Comfort levels aren't vastly different, so don't feel that you have to pay extra for First Class. Consider breaking your journey with an overnight stay in Chur. Seven or eight hours is a long time to sit on a train, and you may enjoy the scenery more when you spread it over two days. ABOVE: The Glacier Express in winter. 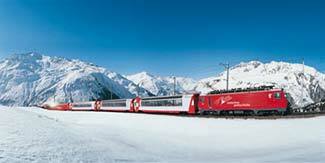 The official site of the Glacier Express has information about the train in several languages. The RhB is a narrow-gauge railroad with spectacular bridges, spiral tunnels, and some of the most appealing scenery in Switzerland. The Glacier Express operates on RhB tracks between Chur and Davos or St. Moritz. Save money on trains, postal buses, lake steamers, funiculars, cable cars, and local transportation with a pass from Swiss Federal Railways. Photos copyright © Swiss Travel System.